You can teach your dog a reliable come command by following the steps outlined in this video. The methods demonstrated have worked for thousands of dogs over the past 30 years. We believe your dog should be taught this response using multiple training methods, all with the same outcome, the dog comes when called. The methods demonstrated on this training clip will work for all breeds, and all ages of dogs. Also, anyone, from a young adult to an older person, can use our methods. The human student does not have to be agile enough to use a rope, or young enough to race after the fun loving canine. We train using our brains to interest the canine student. This program can be a lifesaver for your canine. It will work at a distance, and when the dog is distracted, such as when chasing a cat. 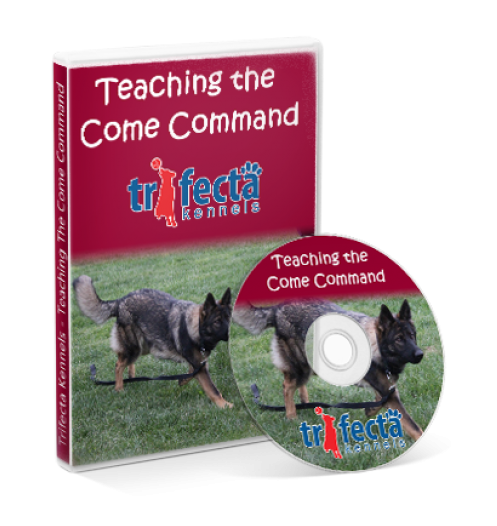 Have fun with your dog while teaching the foolproof all important come command. This video shows you many ways to do exactly that. The system will allow you to view the Youtube video as many times as you’d like. You may also use a Youtube video saving converter to save a copy in a secure, safe place on your own devices. We give access in this way because video files are very large and many have trouble downloading the video files directly. It is your responsibility as the purchaser to ensure that your device can play this video prior to purchasing, we cannot offer refunds due to incompatibility.